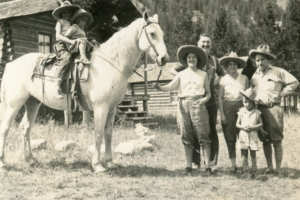 When beginning the search for a guest ranch, most places you will encounter have a tagline about family. Here at Covered Wagon, it is not just a phrase. 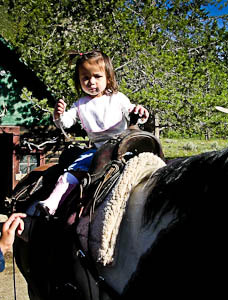 We are a small, family operated ranch centered around creating a personal, one of a kind experience for all of our guests. And yes, when you are here, you are family. First and foremost, we have our wonderful crew. For the 2015 season, our return guests will be seeing some familiar faces as well as meeting new people. But whatever the case, our crew is a huge part of what makes Covered Wagon so special. 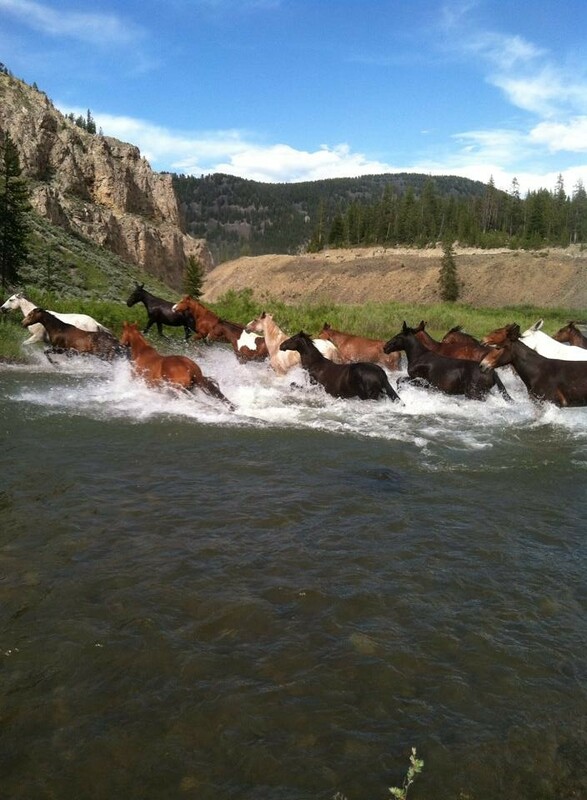 Our ranch can hold 24 guests a week maximum, and we normally have a crew of around 14 to handle everything from the horses to your cabins to reservations and meals. Our crew is always friendly and very hard-working, and we all love what we do and where we live. You can always find us hanging out around the ranch, willing to take time out of our schedules to talk with everyone – because that is why we love what we do! 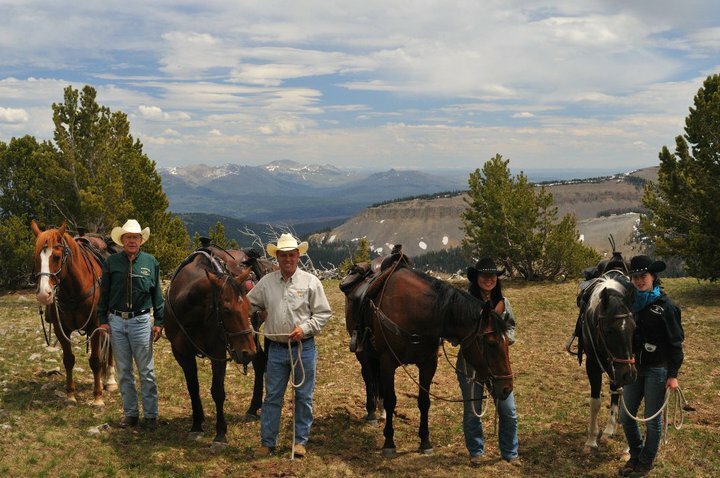 Our ranch is not at all a guest ranch that discourages crew from mingling with guests – we will do everything with you guys, and hopefully find some wonderful new friends every year. We love meeting people from all over the country and world, getting different perspectives, and sharing our lives and our backyard with all of our guests. 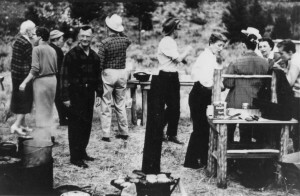 Whether it is at the Friday night cookout, or just after dinner hanging around the campfire, our Covered Wagon crew will treat everyone like family because we are one too. 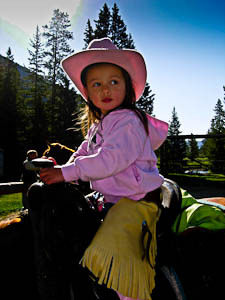 Our size and personalized operation also allows the Covered Wagon guests to form their own vacation families. We are fortunate to have people return here year after year – some of our guests have been coming to the ranch for more than 30 years now! People come back with their children, grandchildren, friends, nieces, nephews, and everyone in between to keep our guest family growing. 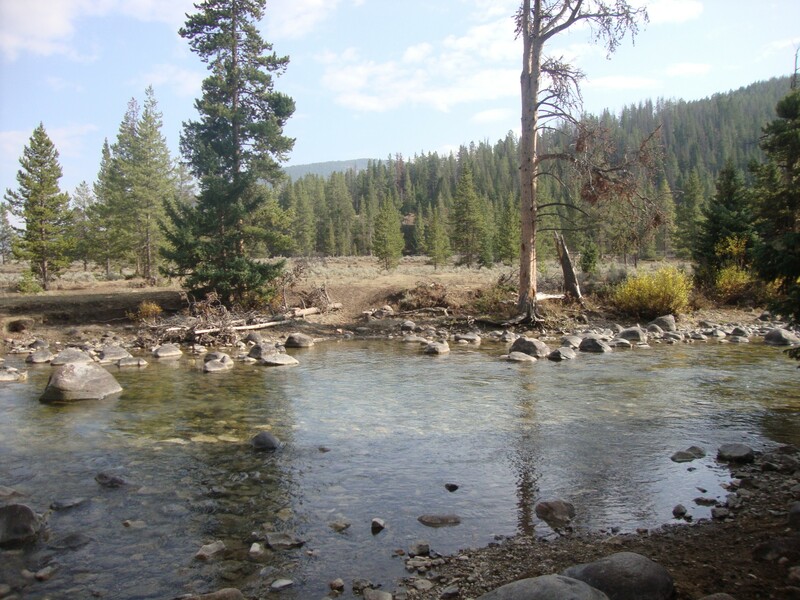 We have hosted reunions, big groups of friends who love the West, and sometimes just a father and son who love fishing the Gallatin, but when everyone gets here their family and friends always seem to grow. We constantly have people getting together who only met earlier that week, trying to book for next year with the same group of people because they enjoyed their time together so much! Whether you are here by yourself or with a large group, by the end of your stay I guarantee you will leave with some new friends, be it crew, other guests, or both. 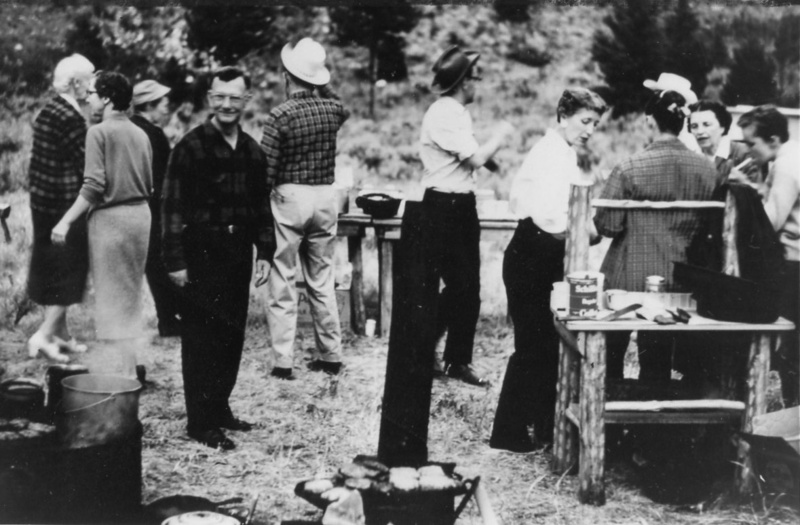 Everyone eats, rides, plays, and hangs out by the campfire together, and each week it is wonderful to see different people meeting and making a real bond, or old friends running into one another again. 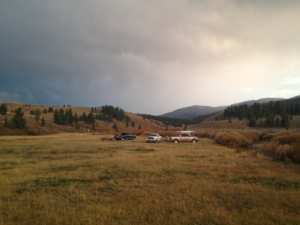 View of the ranch from our Sunshine ride. We also are just such a small operation that we allow everyone to pick and choose what they enjoy, and do it with whomever they want. If you want to go on rides with just your family, we will try our best to make that happen. If you have new friends you want to explore with, we love that too! 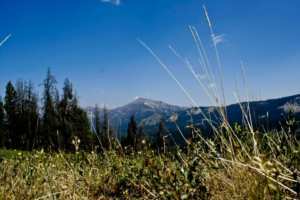 Hiking buddies, people to go explore Big Sky with, friends to raft with, or just acquaintances to hold your hand before zip-lining make a huge difference. People who talk to us about booking always want to know every detail about our ranch that makes it special, but at the end of the day, Kurt, Melissa, and myself always come back to the same thing: there is just something about this place. Covered Wagon has a magic all its own that just seems to keep people coming back here. 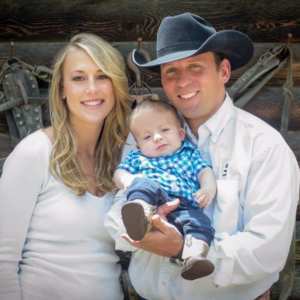 Personally, I think the scenery, horses, and laid-back western feeling all play a part, but it is the fact that this ranch is always a family that really makes it work. At the end of the day, everyone will always feel welcome here, and whenever you come back, it will always feel like coming home. Melissa posted earlier this month with her reasons to try coming to Covered Wagon, which got me thinking about all the reasons that I love to tell people, and some reason that I never really have enough time to get across while on the phone or with e-mail. So, as I have a lovely captive audience here, I figured we could make February “Why Choose Covered Wagon” month here on the blog. Feel free to comment or post on Facebook your reasons why you chose CWR, or any questions if you are still making your guest ranch decision! First and foremost, my main reason would be our riding program. Quite simply, no one rides like we do. I know, I know, I am clearly horribly biased (it’s true). 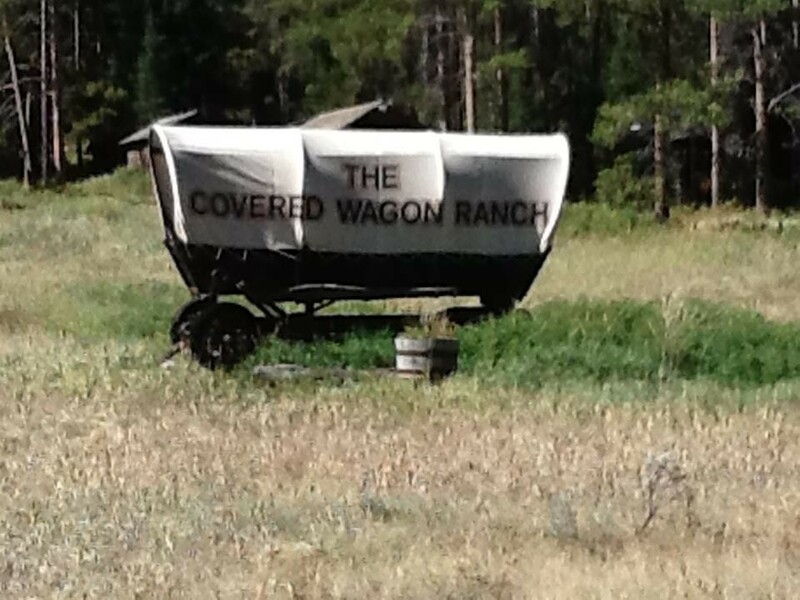 But my statement stands: I have never seen a place with so many personalized options as well as just the vast amount of territory to ride in that Covered Wagon covers. We have half and full day rides for people of all abilities and sensibilities. 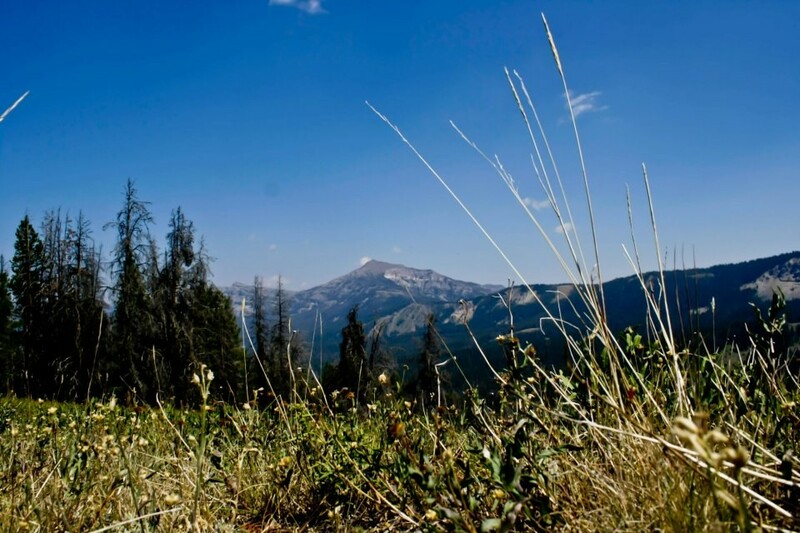 Want to see mountains up close? Fine. Scared to death of heights? Ok, no problem. 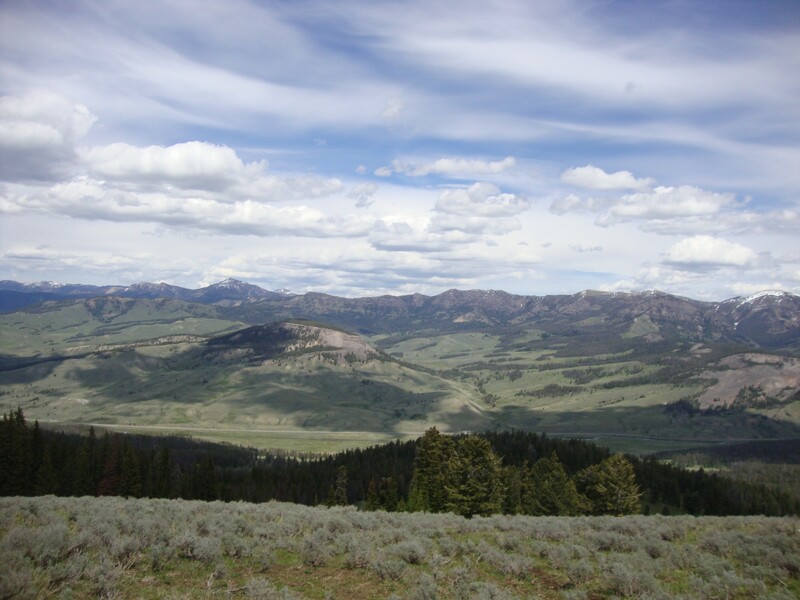 Here at CWR, we ride territory spanning from Big Sky into Yellowstone National Park, with over 100 trails to choose from. We have rides that will take you to 10,000 feet and rides that will let you relax at beautiful lakes. 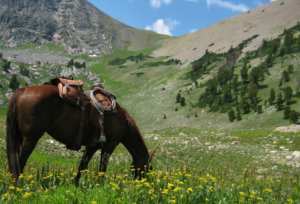 Rides to see amazing mountain views, and rides with beautiful meadows to go searching for wildlife. 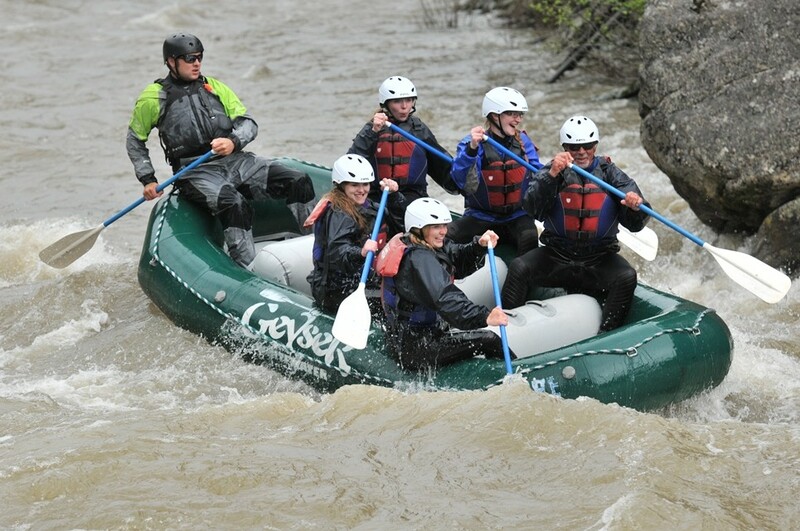 You will cross rivers, conquer cliffs, enter wilderness, traverse meadows of flowers, and see the amazing amount of beauty Montana has to offer. 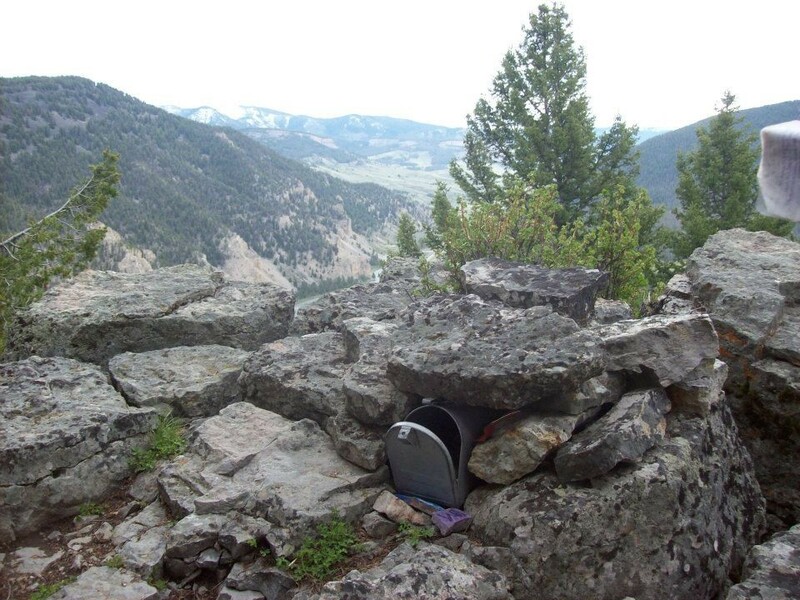 We are honored to have guests who have been coming here for more than 30 years and still finding new parts of the Gallatin National Forest to explore. Benson Point – a beautiful hike too! 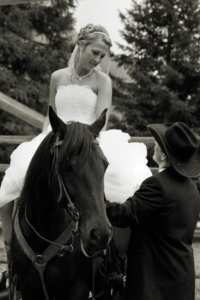 We have rides to cater to any duration you wish to spend in the saddle. 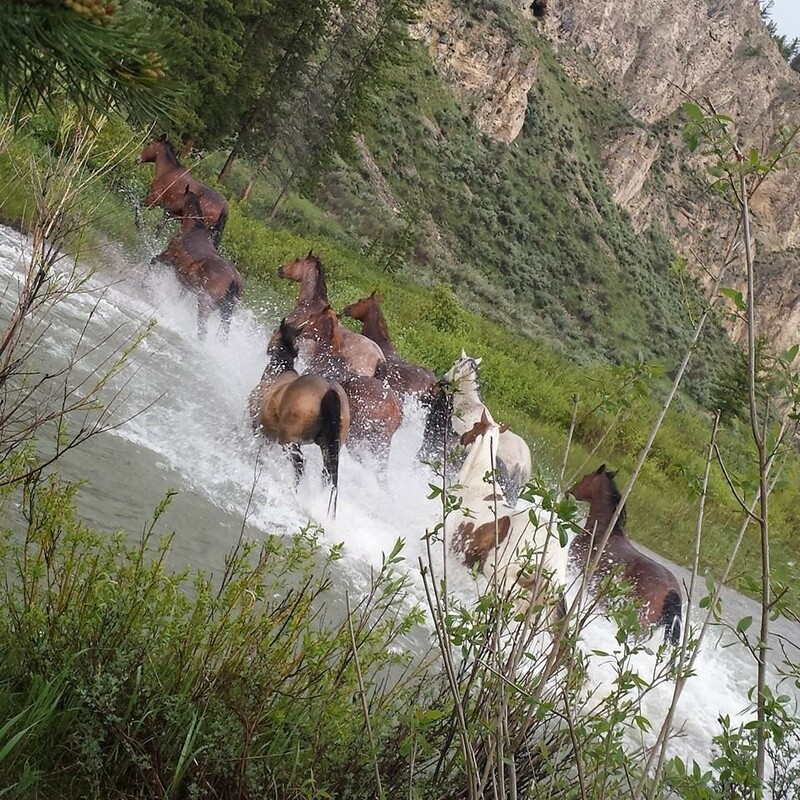 Covered Wagon also has over 70 horses and mules, so your perfect riding partner is here, we promise! 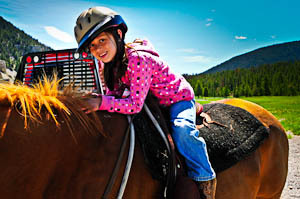 And we will give you a horse to ride for the entirety of your stay, allowing you to bond and really get to connect with these animals that we consider family. You will also have your own saddle for your time here, allowing you to get comfortable. Our wranglers are amazing as well, more than happy to teach everyone whatever you want to know! 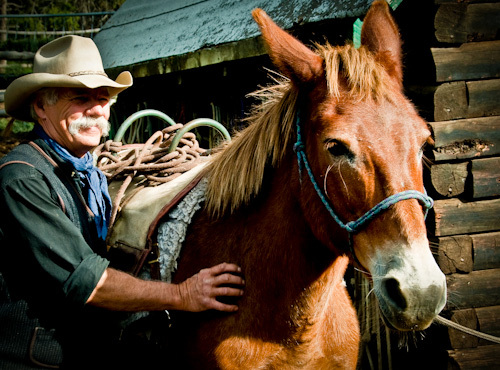 From how to unsaddle your horse and turn them out to how to become a better rider, we truly offer the full Western horsemanship experience. I know that many of you have probably heard this speech (or parts of it) before, but our riding program is truly one of the best I have ever dealt with or heard of in the guest ranch industry. I know I feel truly blessed to have access to all of the terrain, wonderful horses, and knowledgeable wranglers while I am here. And hopefully, you will too! So as I said, feel free to comment with your experiences, pictures, or questions, and we would love to hear about your favorite rides at Covered Wagon! Thinking of Visiting a Guest Ranch? 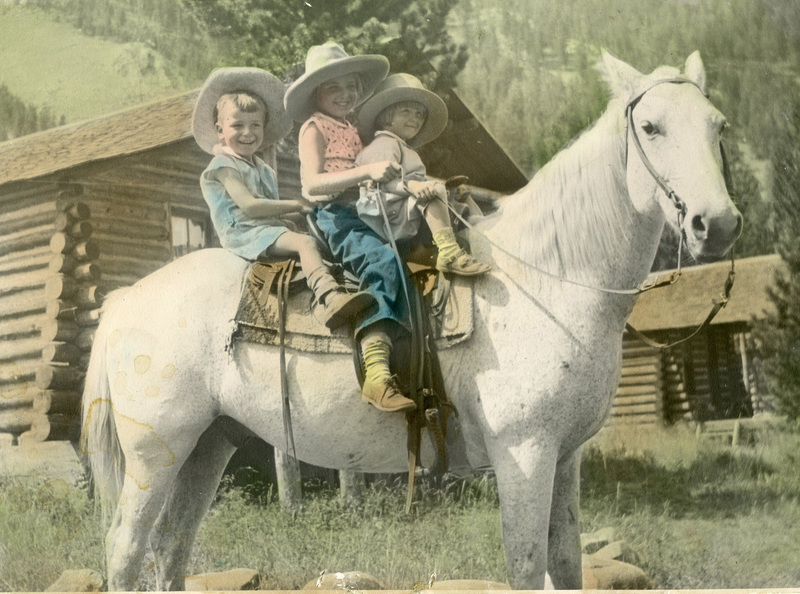 3 Reasons to Give Covered Wagon a Try! 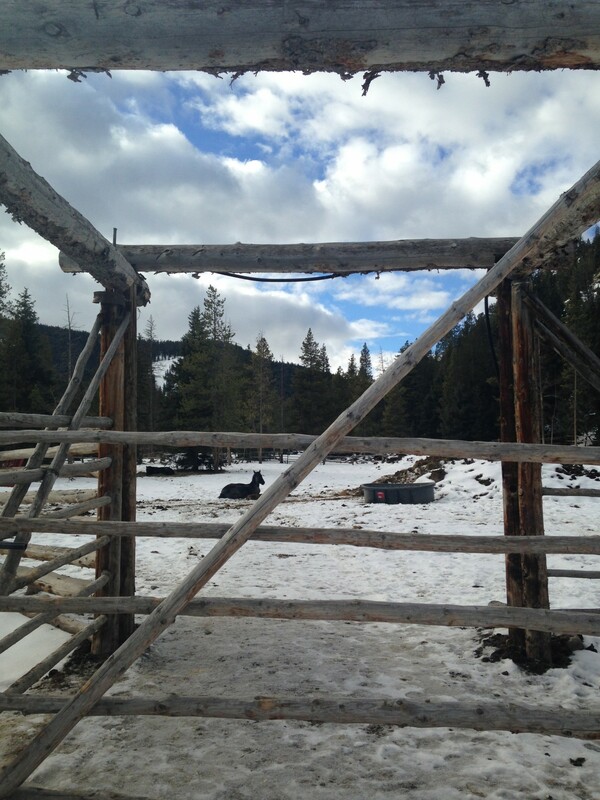 Personalized-Everything from the moment you call the ranch to the moment you pull out our gate is personal. You won’t have online booking software; instead you will talk to the owners and be able to ask questions. You won’t have to figure it all out-we can help direct you in any venture you want to pursue once you are here. 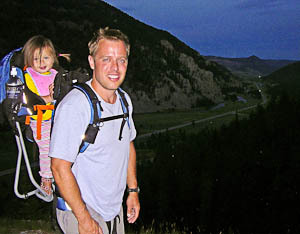 So part of your family is riders and part of them are hikers-we can handle that. So you’ve never seen a horse before, but you want to ride-Okay done! Your sister is a vegan and your kids are picky eaters-No problem! You are on a family vacation so you want to ride with your kids and eat with your kids-done. This is your vacation you tell us what YOU want to do. Unique Setting-The ranch sits in the Gallatin Canyon south of Big Sky, Montana. 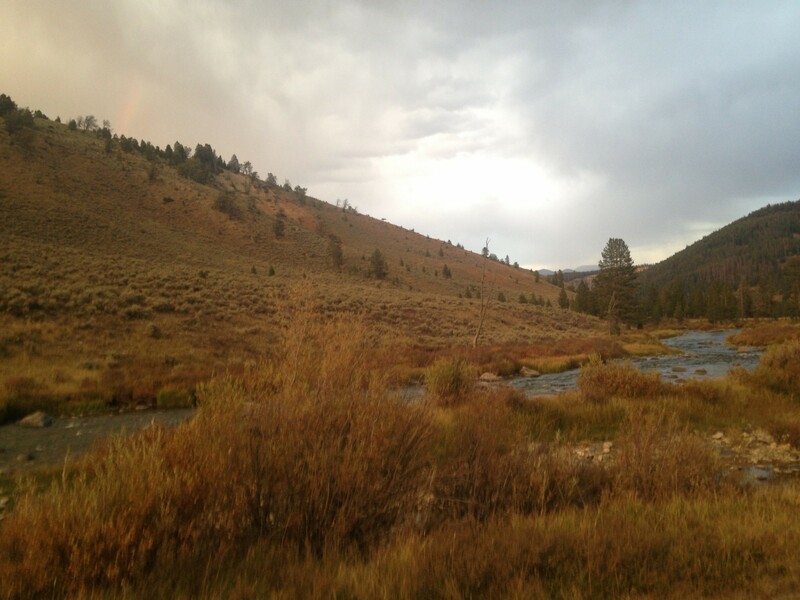 The Taylor Fork runs through the ranch and the Gallatin River runs North to South across from the ranch…known for some of the best fly fishing in the country. 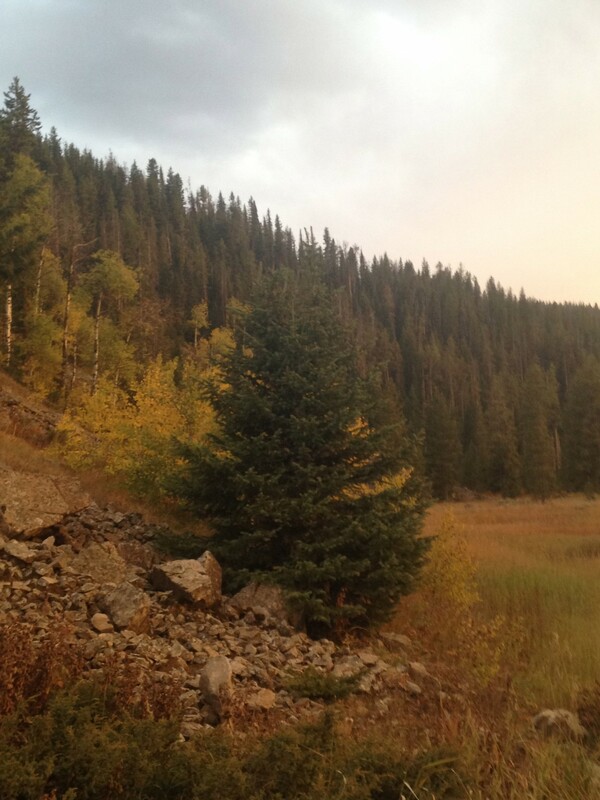 We have mountains, high mountain meadows, creeks, ponds, and mountain lakes. We have deer, elk, bison, moose, coyotes, wolves, grizzlies, and black bears. We have Big Sky ten minutes away where you can golf, whitewater raft, zip-line, and mountain bike. 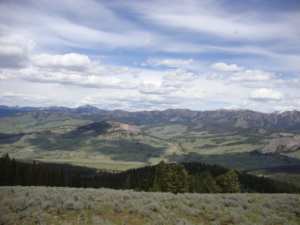 Yellowstone Park is 3 miles away, there are hiking trails out of the ranch, and in my opinion some of the prettiest country in the world at our finger tips. 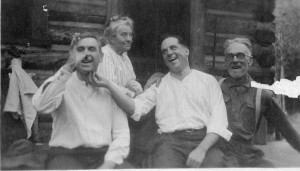 Sense of Community– Once you get here you are family! We are extremely small which allows us to get to know everyone. We have guests that return year after year because of the personalized feeling you get when you are here. Everyone interacts and relationships are formed. 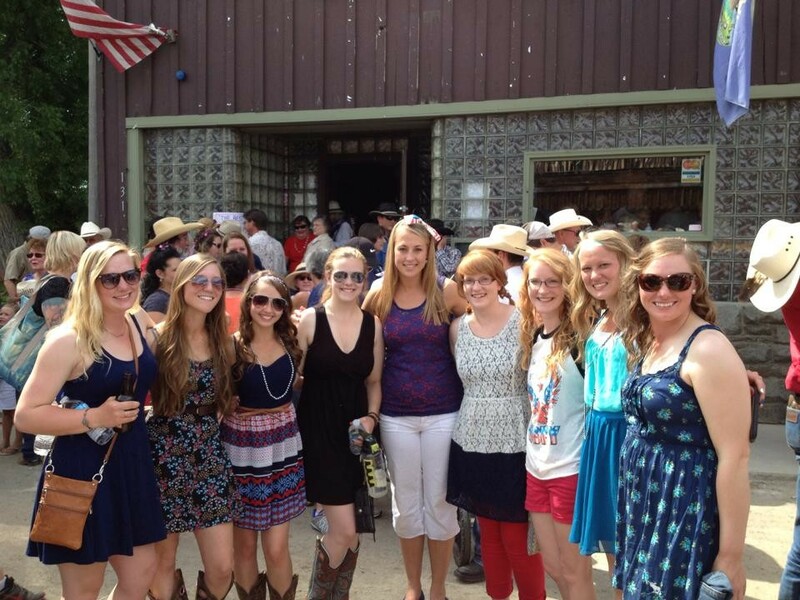 If you are an individual, a couple, or a large family our ranch has a place for everyone! Give us a call we would love to talk to you! 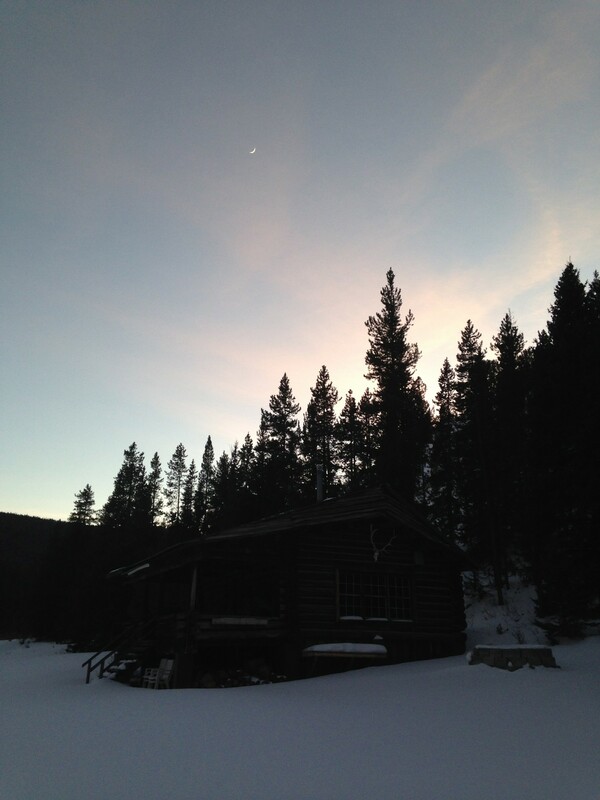 We are enjoying a beautiful (if not necessarily normal) winter here in Montana. It is my first winter in the state, and I absolutely love it so far. 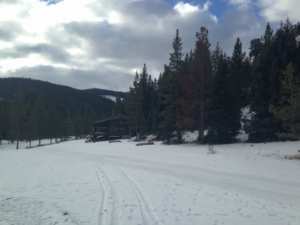 Our backyard of the Gallatin National Forest and Big Sky is the best place for fun in the snow. We have skiing, snowboarding, snowmobiling, and every other activity you could dream up here and I am thoroughly enjoying my education in snow-sports. A mini snowstorm view from my porch! 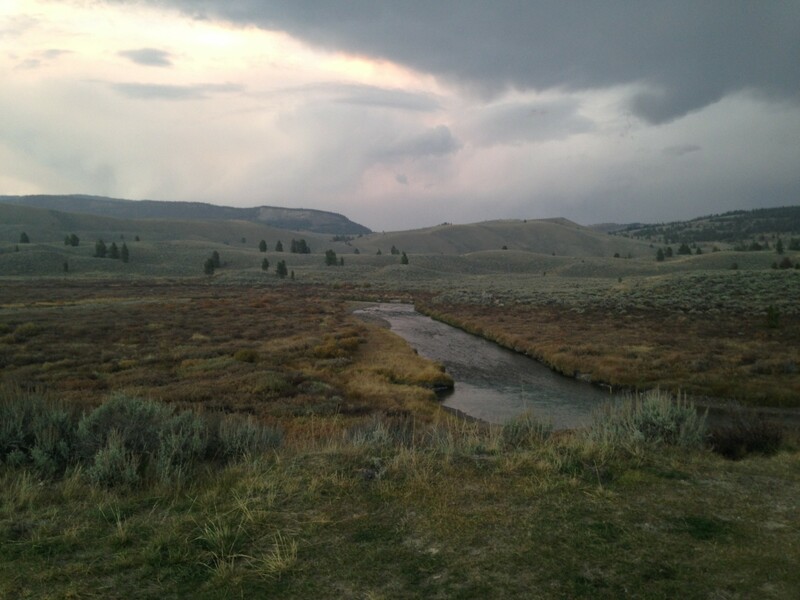 Of course, the ranch is also incredibly beautiful in our off-season too. I took a bunch of pictures here and there to give you guys a better look! We have been having some unusual weather here (for us). Thus far it has gotten to -36 degrees, and keeps yo-yo-ing between bitter cold and forties! But we are still getting snow and regardless, this place is still breathtaking. So now for the update: the babies, Blake and Miranda, are getting absolutely huge! Blake is taller than me now and they are having tons of fun romping around in the corral with Nikita and Pancake. 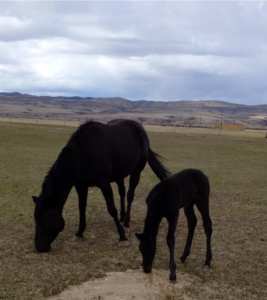 They are both very smart and funny, and Miranda in particular is a precocious little filly who loves to get into anything she is not supposed to find! 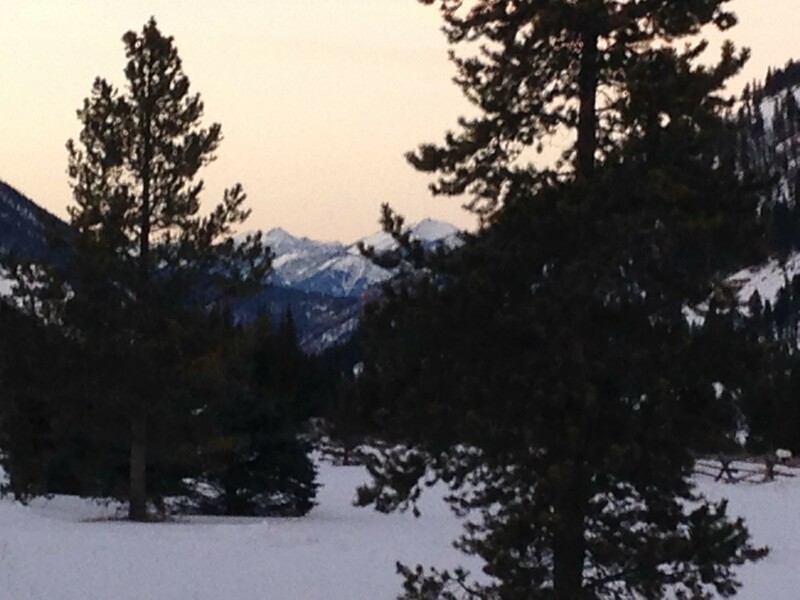 Sunset and the Spanish Peaks in the distance. We are in the process of hiring our crew for the next season, and I can’t wait for you all to meet new and familiar faces again! We are booking up for next season, so if you have not called for your reservation yet, please do 🙂 We would love to have all of you guys, so call or visit us in the snow! We love winter, but all of us here are already starting to look forward to our 2015 season. So, hope wherever all of you are, you are staying warm and enjoying your January! 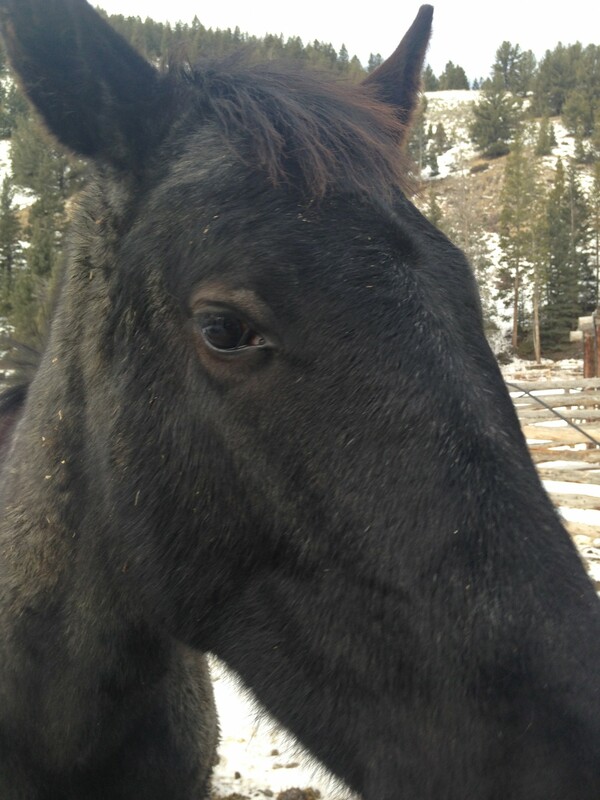 Well winter is here at the ranch and so it our mare Rita. Many of you were here when Rita got hurt this summer or have asked about her progress so I thought I would share a little of her story as well as the progress since her injury in August. 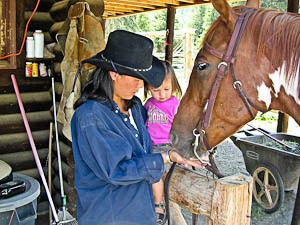 Rita originally came from one of the ranch’s previous employees Jeremiah. He had picked her from the Big Hole country by Dillon, Montana. Kurt loved this little mare and to this day says she is the best cow horse we own and I quote “She will lay her ole ears back and bite a black cow.” Kurt cowboyed off of Rita when he was working at Sitz for a couple of years, until we came back up to the Covered Wagon and I rode her in our wedding. 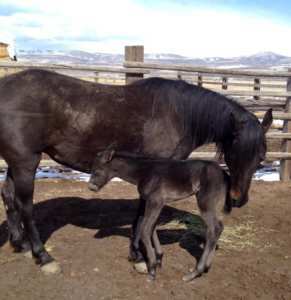 The next year when we decided we want to breed a couple of horses we knew right away she was one of them we wanted to get a baby out of. Kate and her spent the end of the winter with us so we could keep an eye on her. 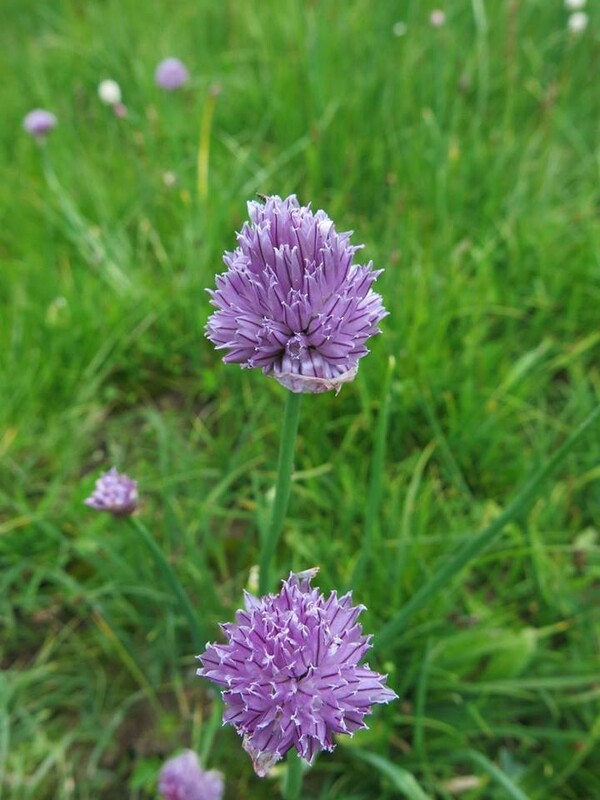 This spring she had Miranda, and became a wonderful mother. When it was time to breed her again, we decided to wait due to the fact we wanted to work cows on her and ride her this year. Needless to say if we would have known then what we know now we would have bred her again. 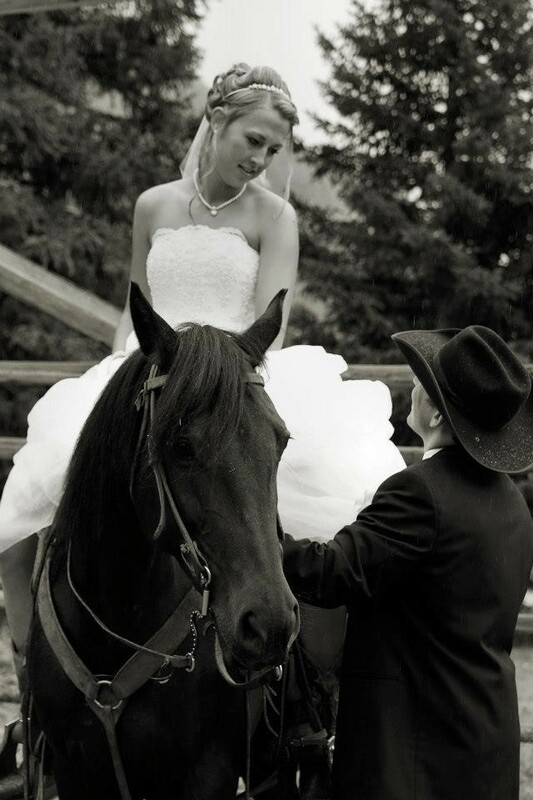 Rita is a phenomenal horse all around, from cows, to trail rides, to our wedding, and motherhood she has done it all! And let us know forget how beautiful she is. Rita was trailered to Hardaway Veterinary Hospital because she had injured her left hind leg while turned out with her foal, Miranda. 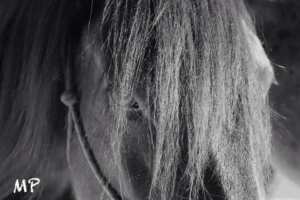 When she arrived at the clinic, it was obvious to me right away that Rita was a very special mare with a lot of heart. 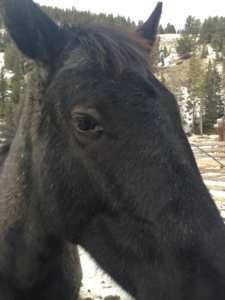 Even though she was barely able to put weight on her left hind leg and was in a new place with her foal, Rita was a calm and very well-behaved horse to work around. In examining Rita I noticed that she had swelling around her fetlock joint (see picture) and in the tendon sheath of her left/right hind leg. 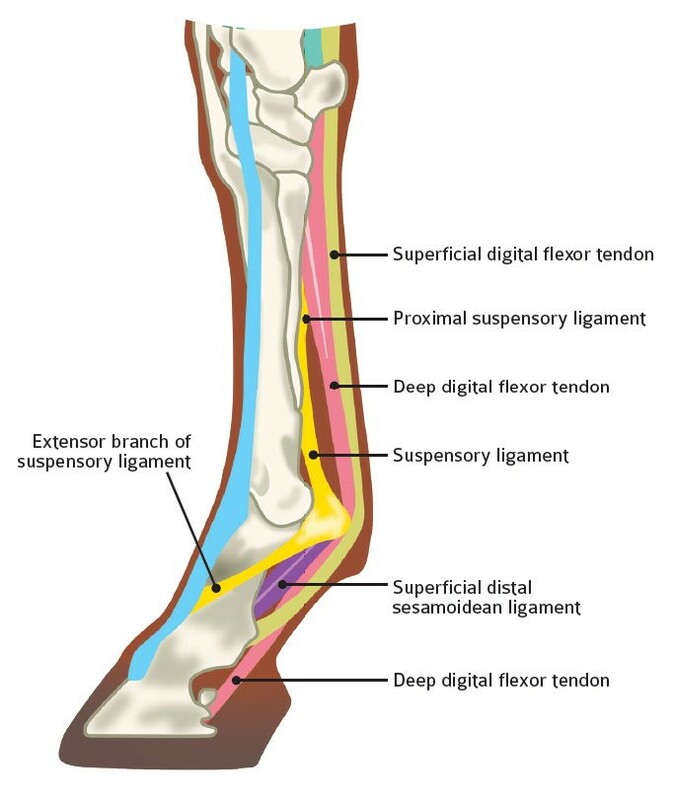 A tendon sheath is a structure that wraps around the tendons in the back of the fetlock joint so that the tendons can glide freely past each other as the horse moves. After some investigating, I determined that Rita had injured her deep digital flexor tendon and the branches of her suspensory ligament. 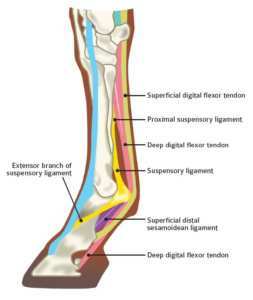 These tendons and ligaments are very important in supporting a horse when they bear weight on their leg. In order to treat the injury, we needed to give Rita external hind limb support so that her tendon and ligament could begin to heal. A fetlock support brace was built by one of the staff members at Covered Wagon Ranch (Austin) to act as a support sling for Rita’s fetlock. A wedge was placed under her heel to decease the tension on her tendon. In addition, Rita received cold laser therapy (a treatment that stimulates healing using a specific wavelength of energy) to help her tendon/ligament heal and decrease the chance that she will re-injure herself in the future. 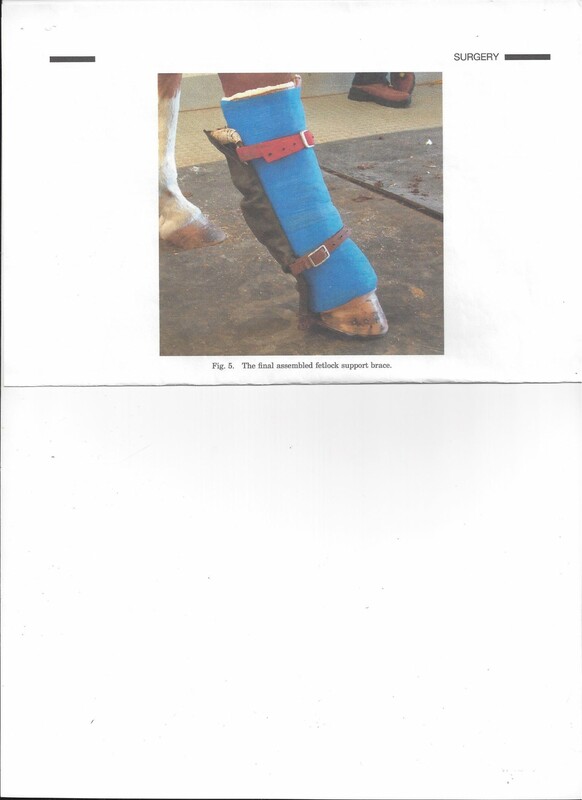 All of this was done in an effort to make Rita more comfortable and to promote tendon/ligament healing. Over the course of the next week or two, Rita began walking comfortably on her left hind leg. She was making great progress! As a result, we were able to start her on a 9 month long road of rehabilitation which began with hand-walking once a day for five minutes. Rita is back home at the ranch and Kurt and Melissa have been caring for her daily with hand-walking and bandage changes. At this point, she is walking comfortably once a day for 20 minutes. She looks great and we are hopeful for a full recovery! It has been four months since her injury; she is no longer wearing her support brace and walking great. She is in a run under the barn and each day she gets 20 minutes of hand walking for exercise. We still have a long road ahead of us with and uncertainty if she will ever be fully sound. However, as we tell everyone these horses are our kids and it is our responsibility to take care of them through better or worse. 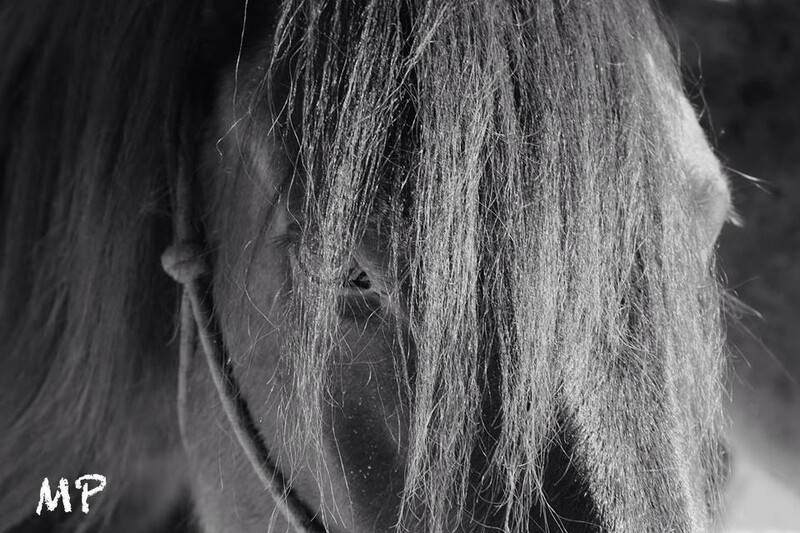 This is just one of our 71 horses story. We just think she is extra special. A big thank you to Dr. Parrot, Dr. Hardaway and everyone else that took care of Rita while at the vet for the nearly three months she was there. Also a big thank you to Austin (our adopted son/employee) and Tom Fisher (Kurt’s MT dad) for making the intense brace that Rita wore (see picture) and Eryn and Keaton for helping doctor this mare at the ranch. Well, it is officially winter in Montana and thus far, it has been absolutely beautiful. We have been hard at work here, finishing projects and getting all of our horses to winter pasture – just generally getting the ranch ready for the winter season. Most of our wonderful 2014 crew has left us, and we are slowly winding down into the off-season. For my first winter in Montana, I definitely wanted to experience all the country has to offer – and just living here has been such a new experience. It is sunny, if cold, and we constantly have a really pretty blanket of snow on the ground. Everyone around here skis and snowboards, or snowmobiles, and I am very much looking forward to learning how to be a real winter person (ironic since I am from NY state). So far, we have avoided the famed freezing temperatures of -40 or so, but I am sure they will grace us with their presence very soon. 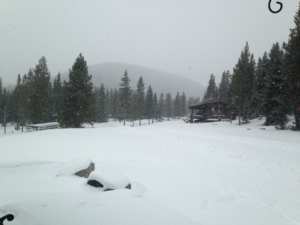 I will keep you all updated on the ranch and our misadventures in our winter wonderland as the off-season continues. As it gets closer to the holidays, I just wanted to take a second and sincerely thank all of our guests – even those we won’t meet until next summer, for allowing us here to do what we love every day. You guys brighten our days with your posts and emails and watching everyone experience the country that I have come to love and call home is something I would never give up for anything else in the world. All of our guests have such a unique perspective, and I personally have learned so much from everyone who comes here. Without each and every one of you, we wouldn’t be able to live this amazing life, riding horses and hanging out in some of the most gorgeous land in the world. All of us here at the Covered Wagon really appreciate all of you – and hope you guys are having a wonderful and fun – filled holiday season! Also, Blake says hi. He really likes cameras. 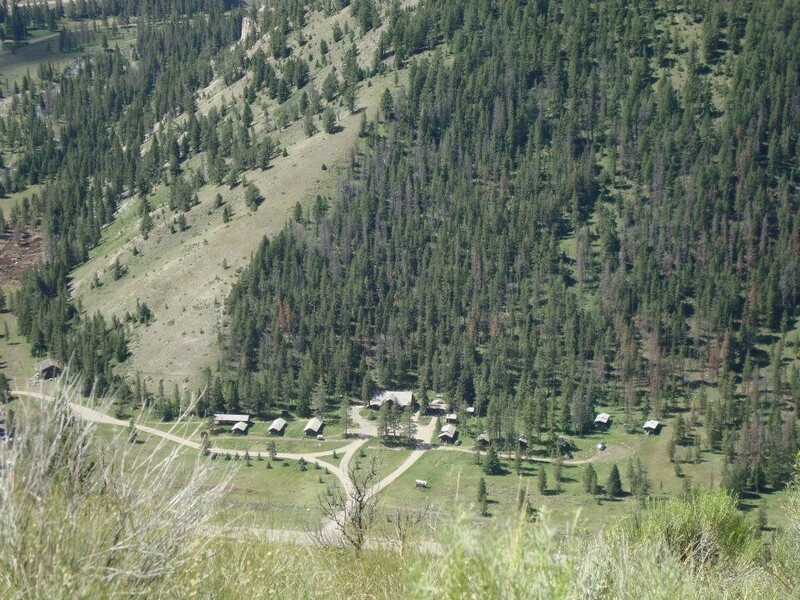 Now for the ranch update: we are still going here with our last week of guests this year. The weather has been mostly beautiful for us (though we did get a bit of snow last week!) We have had an amazing summer full of old and new friends. It is hard to believe that the season is almost over already – it seems like it has just flown by. We have loved seeing each and every one of you, and thank you so much for coming to visit! We hope you will be back soon. 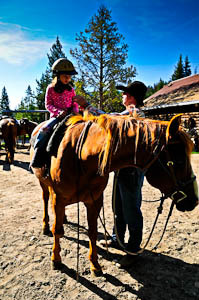 The wrangle here at Covered Wagon has long been one of our guests’ favorites. Whether you have been coming here for 10 years or this is your first, I guarantee the wrangle is a sight you will never get tired of seeing – I know I never do. Our horses going across the Taylor Fork River! What is the wrangle (all of you newbies yet to come ask)? 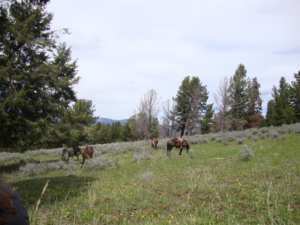 The wrangle is when we move our entire herd of horses (72 head at last count) through the gorge and up Cameron Draw to our pasture on top of the mountain. We sit on 5,000 acres here, and we love to let our horses out to graze at night – so much so that we’ve started wrangling almost every day now! 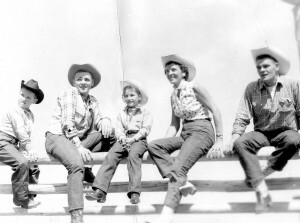 Then, very (very) early in the morning, your wranglers will go back up the mountain on horseback and jingle them back in for your rides that day. 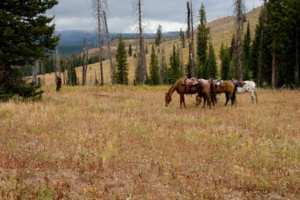 The wrangle is generally later in the afternoon after everyone is back from their rides, and we are always more than happy to give you a ride down Taylor Ford road to a prime viewing spot for photographs and videos. 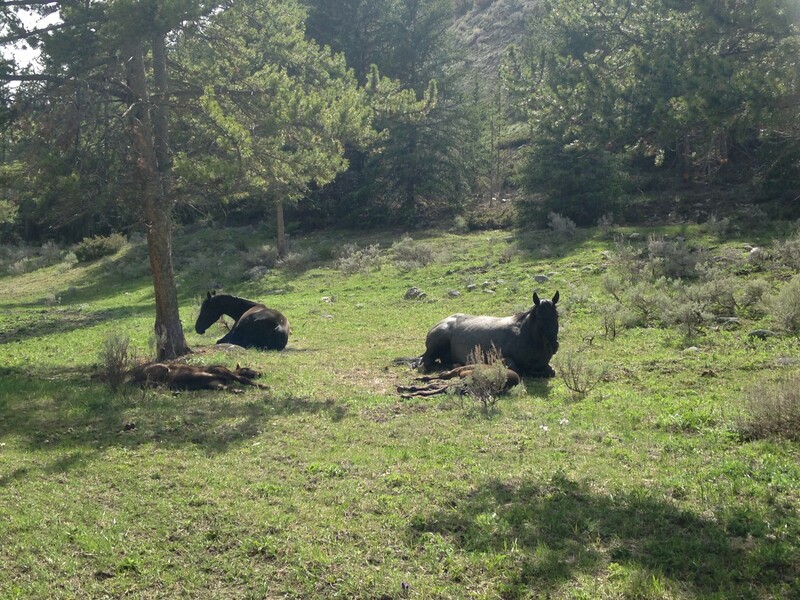 Everything here at the ranch is in full swing – we finally got some rain today, but the weather has been wonderfully gorgeous and the horses and crew are happy and waiting for all of you that have yet to arrive! Hope you all are having a good summer! I hope all of you had a wonderful Fourth of July weekend. Here at the Covered Wagon, the fourth is a special celebration day. 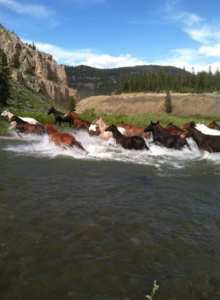 We pack up all of our guests and crew and caravan to Ennis, MT for the parade and rodeo. The parade is in the morning, and it is the perfect small town parade: all local businesses and everyone participates in making a car or wagon or float to show off. We park right in front of the Silver Dollar Saloon and try to duck the candy/water guns as they roll by. 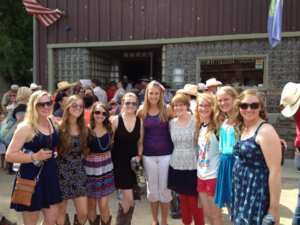 All of us girls watching the Parade! Then it is a few free hours for shopping! There are many boutiques and stores in Ennis to draw crowds on the fourth. Us girls here at the ranch are rather partial to Benjie’s – a little jewelry etc. store that has everything sterling silver at 50-60% off! 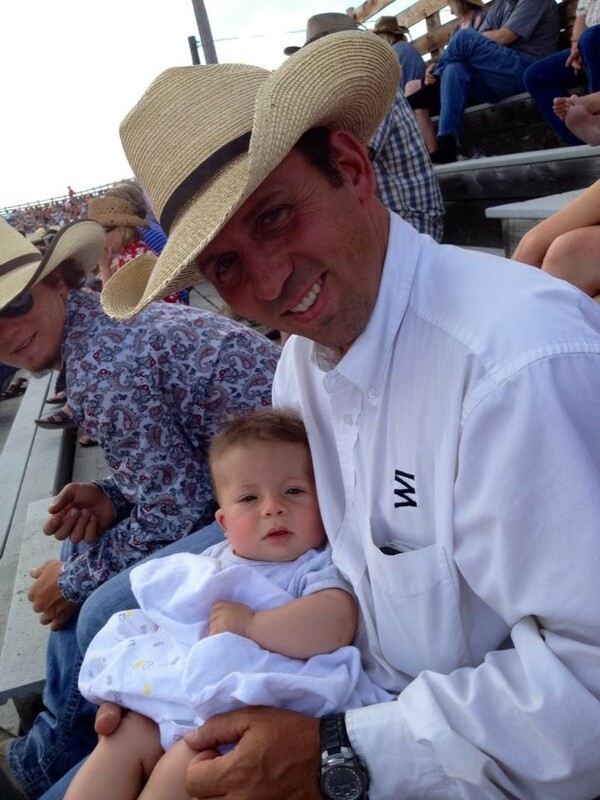 As the afternoon goes on, it is rodeo time! Ennis has a great rodeo for the fourth, and families and couples alike will be very entertained. 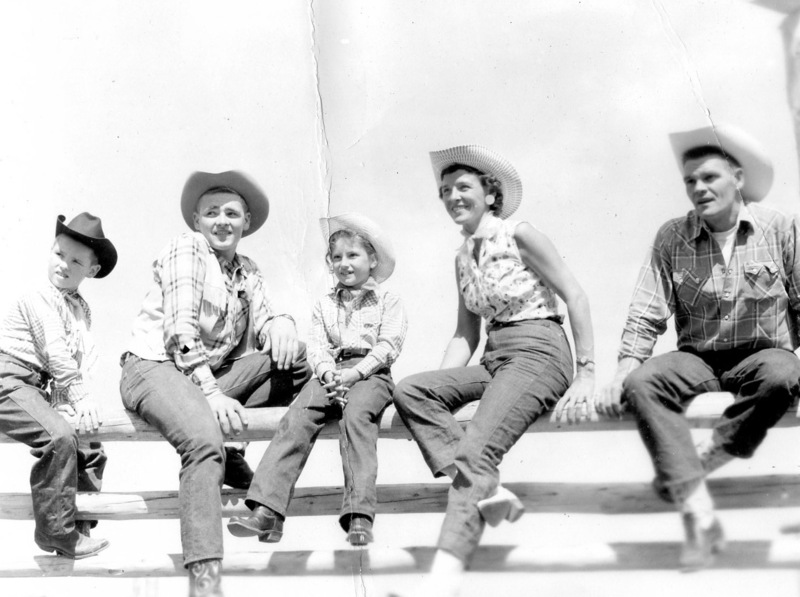 Finally, it is back to the Covered Wagon in the evening for our traditional cookout on the fourth: steaks, burgers, hot dogs, and brats at the rec hall with some live music and some time to practice those rodeo moves. It is finally summer here, and we have been having absolutely gorgeous weather. Warm in the day, perfect for riding (especially at higher elevations where you cool off as you ride up), and still great weather at night to cozy up to a fire and hang out with all of us guests and crew. Hoping everyone is having as fantastic of a summer as we are! Can’t wait to see and meet all of you, and hope you all get here or come back soon! So, many of you reading this have been to our ranch and consider it your home. 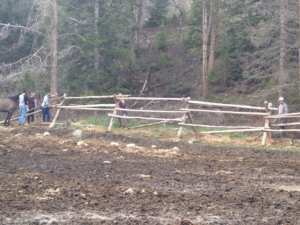 If this is you, feel free to skip to the bottom and read our update on ranch activities :). But for those of you considering staying with us, or anxiously awaiting your first stay here this summer, I figured I would post what an average day on ranch looks like. 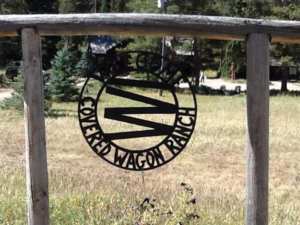 It is one of the most frequently asked questions when people are thinking about booking with us: how exactly does a day in the life of Covered Wagon Ranch work? Well, first is breakfast – the most important meal of the day! Our chefs will tempt you with everything from eggs to order to a daily pastry. And after you’ve had your coffee and start to look more awake, Kurt or Melissa will sit down and visit with you about what you would like to do that day. You have several options with riding: either a shorter morning ride, or an afternoon ride, or a full day ride where you would take a delicious sandwich with you for lunch on the trail. 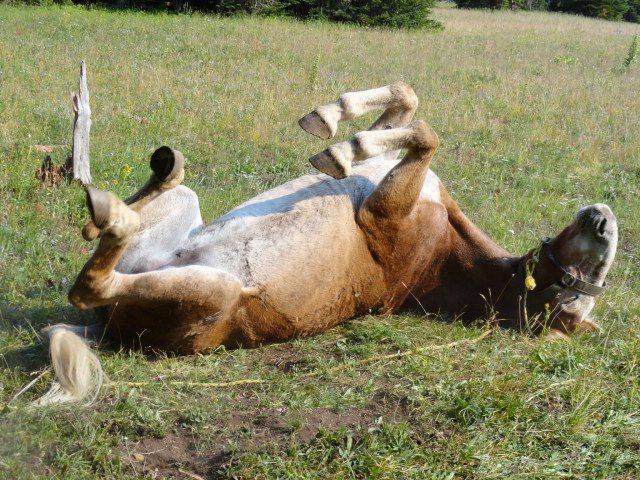 We have a horse program that we would put up against literally any guest ranches. There are over 100 trails to choose from, so feel free to tell us if you like/dislike scenic rides, mountain views, pretty meadows, serene lakes, or anything else! (Really though, if you have a preference, we definitely have a ride for you). We also keep track of what horse you rode and where you went so coming here year after year you never have to see the same territory – or we can take you back on your favorites. If riding is not your cup of tea, or you simply are still a little bow-legged from the previous day, we can set you up with one or more of our friends in the canyon to do another kind of adventure: whitewater rafting, fly fishing, or zip lining. 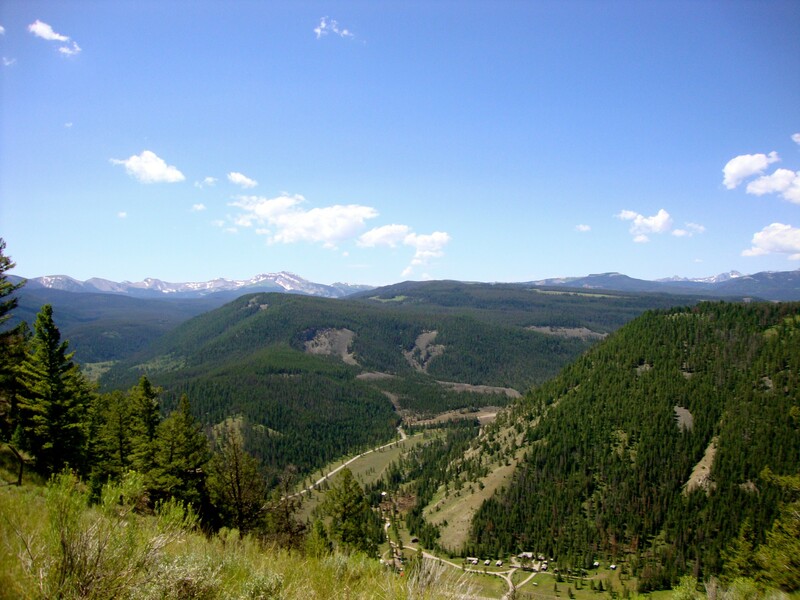 Or if you would like to take advantage of our proximity to Yellowstone National Park, we can make you a lunch and point you in the direction of any sites you have heard about! 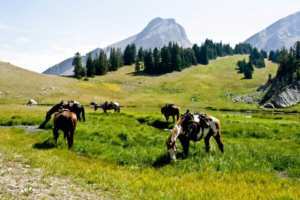 We also have several hikes to go on, from the ranch or feel free to hike a trail that we ride (though we warn you, some of them are quite long). Rides go out around nine a.m. after you have gotten an orientation from one of our wonderful wranglers. And your day is completely up to you! Whether it is sitting on your cabin’s front porch with a good book or going on an all day ride into the Rocky Mountains, we try to make each of your stays as personal and perfect as possible – so just let us know what you are feeling like doing that day. In the evening, appetizers (and unofficial drinks) start at 6:30 with dinner following at 7p.m. Then, if you can heave yourself up from the table (because some physical effort will be required – our chefs are a little too good at their jobs) we have a fire every night outside the lodge. Everyone feels free to hang out and chat about their days. On Friday nights, we also do a cook-out: a barbeque with live music, roping lessons, and maybe some hilarity watching the crew try to dance. Every day at Covered Wagon is different, and you can make your vacation as active and full or as relaxing and moderate as you would like. Well it is finally here – opening day! 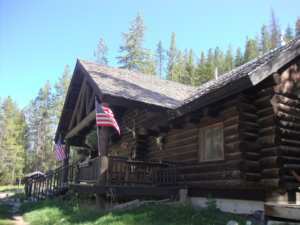 It is a beautiful sunny day in Montana and we are anxiously awaiting our first guests of the season. The lodge is stocked full of cookies and the fireplace is crackling, the cabins are beautifully clean, and all of our horses are here from winter pasture and looking ready for a ride. 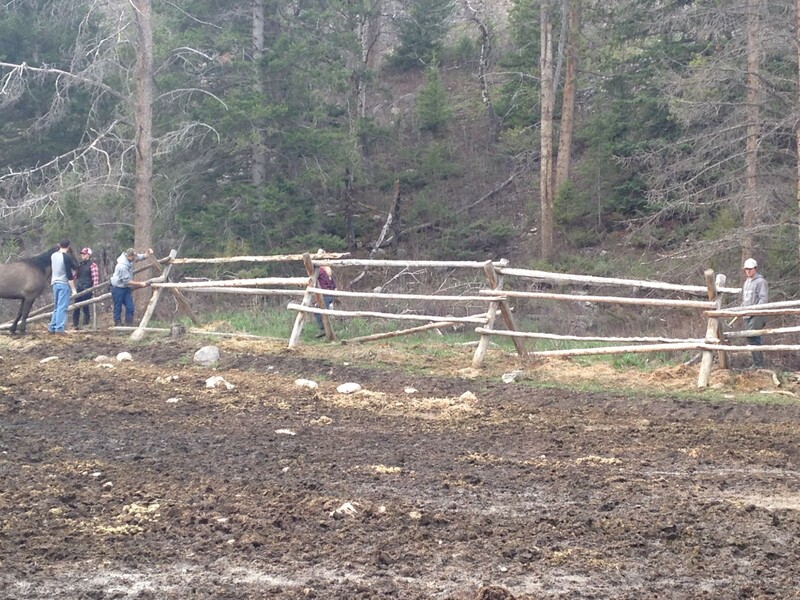 Your 2014 crew have all been working hard to get the ranch in perfect shape for the summer. This year we are so lucky to have staff from all over the United States. Our chefs Nate and Rob are from Michigan and Ohio respectively, along with our server Kaylie and dishwasher Ryan who are also from Michigan. Our returning housekeeper Sharon, and her sister Minda are both from the great state of Washington. As for our wranglers, most of you returners will recognize Austin from Ohio, Keaton from Wisconsin, and Kaya from Montana. Our two new girls are also wonderful: Sabrina from Mississippi and Taylor from Montana. 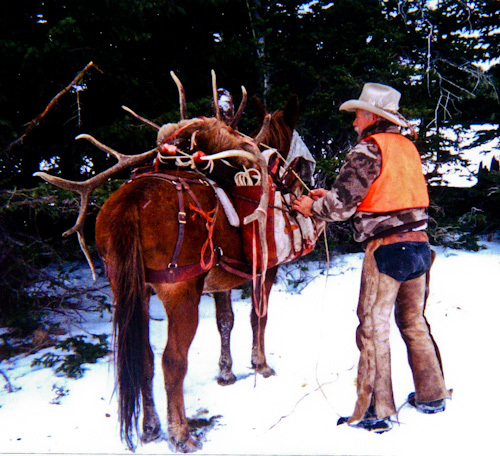 Our ranch hand, Tristian, is also a native of the state. And as you know, I am originally from New York and holding the spot of resident Yankee. We have an absolutely fabulous crew this year, so hurry up and get here so you can all meet them! Working at the Covered Wagon definitely has its perks. 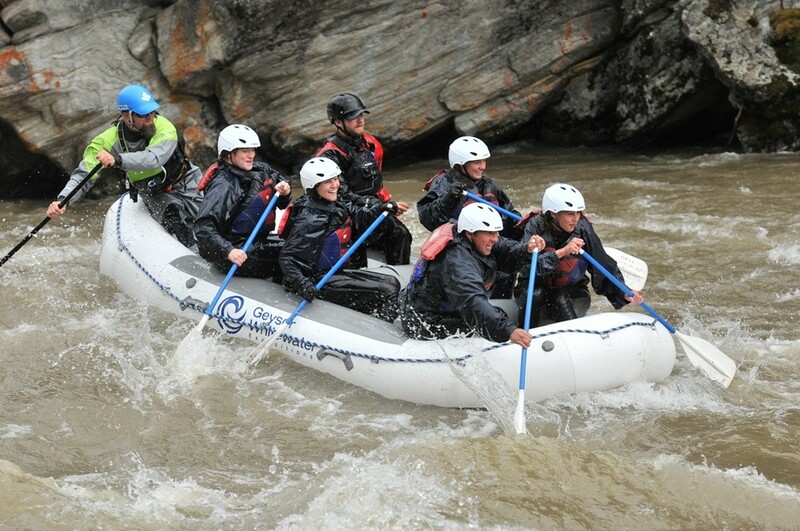 One of the big ones is that Kurt and Melissa take us all on a whitewater rafting trip with the Geyser Whitewater company here in Big Sky, so that we can actually tell you guys what rafting down the Gallatin River is like. It was my first time rafting, and I completely loved the experience. The river is really high and fast right now, and the views are gorgeous! Part of the Geyser experience includes a photographer documenting your trip, so we can share with you guys our experience (and funny faces)! Not bad for not knowing what we’re doing! Kurt and Melissa and crew! So we’re up and running and can’t wait to see all of you! Here’s to a fantastic 2014 season! Well it’s that time of year again! The snow is melting, the mud is back, and our crew is starting to arrive. We are officially gearing up for the 2014 Covered Wagon Ranch season. Your wranglers, both new and returning, are here and putting some of the first rides of the season on a few of our horses. Our new head chef and chef, Nate and Rob, are in the kitchen and cooking delicious meals for all of us (and chocolate chip cookies!) The Lodge is open, the gift store is being stocked, and we can’t wait for all of you, our new and returning guests, to start to arrive. 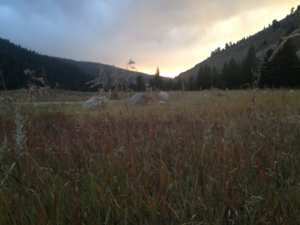 It is spring in Montana, so the elk are on the move and all sorts of wildlife are coming down to lower ground. This morning we saw a big beautiful mamma black bear with triplet cubs move through the ranch! And of course our own mammas are doing wonderfully. Big Nose Kate, her colt Blake, Rita and her filly Miranda are all enjoying having the run of the ranch. The babies are adorable and love romping around just as much as they love napping in the sun. Just to give everyone a little bit of information about me, I’m Eryn and I’ll be your office administrative assistant as well as general ranch hand. I was working at Covered Wagon two summers ago as a server and housekeeper, so many of you might recognize me (I don’t think I look that different!) I’m originally from Buffalo, New York but have spent the past year in Buffalo, Wyoming taking care of horses and falling in love with the west. 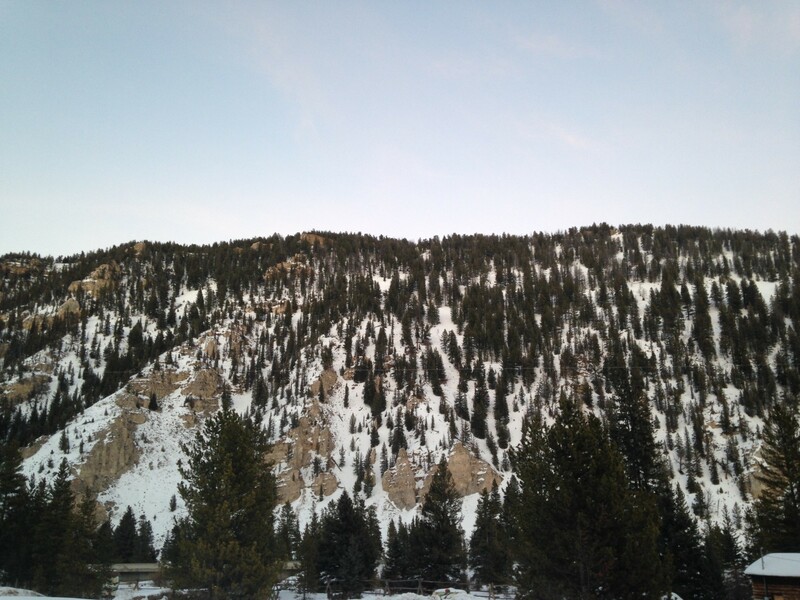 This area of Montana is my absolute favorite place to be, and I am so happy to be back! I can’t wait to see everyone I knew and missed last season and meet all of you first timers as well. Well I think that’s it for us here! We are all busy and working to make your stay at Covered Wagon as amazing as it can possibly be. We’ll keep you updated, and keep counting down those days to summer! 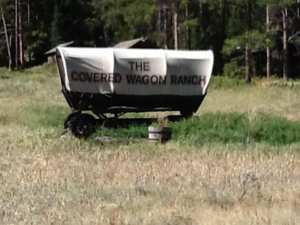 One of our wonderful guests wrote an article in Natural Traveler about her stay at the Covered Wagon. A big thank you to Linda Allen for your kind words, and allowing me to share this wonderful article! 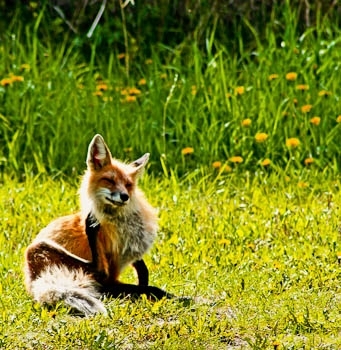 Okay, so I have to admit that ever since the fox story I’ve had writer’s block, and I’m not even a writer! I just love that story and it’s so touching. How do you write something after that? So I thought I would take a different track and go to something different. Hopefully, something funny. 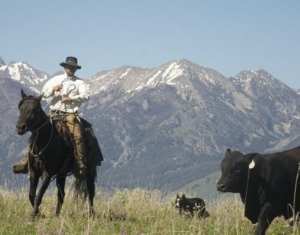 I realize that owning the ranch has definitely given me some amazing situations and tons of material to write about. The people I meet and get to know are fabulous. Every one of them gives me a gift of some sort, as long as I take the time to listen. There are some truly amazing people out there with hearts of gold and bigger than the universe. I’m blessed. Then I get these experiences that I just have to laugh about. Before I start, I must give a little background on myself. Although a health care professional by training, I picked a profession that minimized patient contact but still allowed me to help-pharmacy. So when it comes to things like nausea and vomiting, it’s pretty low on my list of things I can tolerate. It even started for me way back in grade school. I distinctly remember sitting at my desk in First Grade when Roger P. just finished his lunch, drank his milk, then politely threw up on my back. Nice. I was also blessed with a terrible gag reflex. The doctors don’t take my word for it, and when they want to look at my sore throat with a wooden stick, they don’t get very far. It’s a terrible affliction. So in the car we go. She sat in the back seat with a trash can and a box of kleenex as we proceeded up the canyon. Little did I know that our other guest, Tara, suffered from the same affliction as I did when it came to nausea. So there we were. I watched her in the back seat as every ten minutes or so she proceeded to get sick. At times I had to pull over and ask her to stay outside for a minute or two to see if the fresh air would help. I thought this journey would never end. Tara and I tried to divert the situation. The radio was as loud as I could possibly tolerate it. Tara and I nervously chatted with each other as we tried to avoid the noises coming from the back seat. 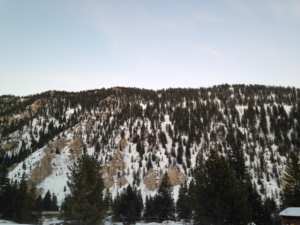 Our skin color changed from a rosy pink from the cold weather to a pale gray for each mile we drove up the canyon. Eyes twitched and darted from nervousness, wondering if we were going to be able to make the trip. Sweat beads started to form on my brow and I felt that my time was dwindling as to how far I could actually make it. Knuckles were white and firmly gripped around the steering wheel. My posture was completely erect and forward so I wouldn’t even touch the back of my seat. My mother would have been proud, but she would have still told me that I should do something with those bangs and get the hair out of my face. Some things just never change. As we entered the mouth of the canyon, I knew that I could finally step on the gas and go faster and faster to town. I prayed the highway patrol was enjoying coffee and doughnuts somewhere and allow me to move at mock speed to the hospital. Our guest was holding her own in the back seat, but I feared I might add the element of motion sickness if I traveled any faster-and this I did not need. We rounded the corner and sped to the hospital (she didn’t need a hospital but it was Sunday and the ER was her only option). I’m embarrassed to admit this, but I must be honest. I generally consider myself a very caring individual, but given the situation I had to do what was in the best interest of all parties involved, and that included myself. I pulled up to the ER doors, proceeded to a rolling stop, and asked her if she wouldn’t mind that I don’t go in with her. I dropped her off in the parking lot. I can’t remember if I actually stopped, but I know she got out of the car. I know. Pretty cruel, but we made it. “Teddy Rides A Moose” is an actual photograph (not “photo-shopped”) from an old Life Magazine. My nephew Daniel just sent this photo along. One of his classmates at Princeton was doing some research on Roosevelt and came across this very cool picture. The description below the photograph states: “Roosevelt once said, “the conservation of our natural resources and their proper use constitute the fundamental problem which underlies almost every other problem of our natural life” (Photo credit: Bettman/CORBIS) in 1906. I really hope that riding a moose is not an example of the proper use of our natural resources!! President Roosevelt was an avid outdoors-man and conservationist and one of the leading forces in promoting the United States National Park Services. He was a particular fan of Yellowstone National Park and did a great deal to promote the enhancement, protection and use of the Park. 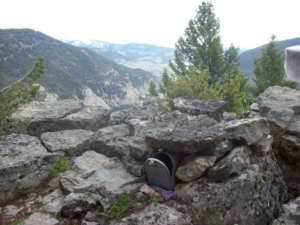 In 1906, Roosevelt signed the Act for the Preservation of American Antiquities, giving the president the power to officially declare natural and historic sites situated on government land as national monuments. “It is a pleasure now to say a few words to you at the laying of the corner stone of the beautiful arch which is to mark the entrance to this park. Yellowstone National Park is something absolutely unique in the world so far as I know. Nowhere else in any civilized country is there to be found such a tract of veritable wonderland made accessible to all visitors” . With these few words, President Theodore Roosevelt dedicated the arch that now bears his name, at the North Entrance to Yellowstone National Park, Gardiner, MT on April 24, 1903. 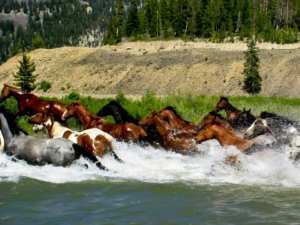 As many of you know, our dude ranch is just 3 miles from the NW boundary of Yellowstone National Park and 35 miles to the West Entrance where you can tour Old Faithful and the Grand Canyon of Yellowstone. 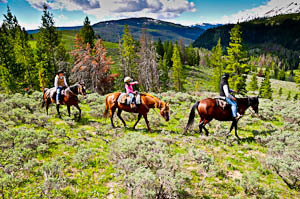 We are proud of our Concessionaire’s Permit that enables us to take our guests horseback riding in Yellowstone as well.